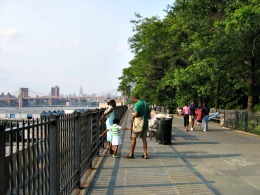 While the neighborhood's world-famous Promenade is what gets many visitors out here, Brooklyn Heights has lots of other amazing things for families to explore. Affectionately known as "America's First Suburb," Brooklyn Heights became New York City's first official historic district back in the 1960s. Today the area is a favorite with families thanks to its lovely, tree-lined streets, gorgeous townhouses, wonderful places to play like Brooklyn Bridge Park and the underground New York Transit Museum, a wide variety of kid-friendly restaurants and, of course, those stunning views of the Manhattan skyline and the Brooklyn Bridge. Our Brooklyn Heights Kids Guide has info on all of those attractions and more so you can make the most of your trip to the neighborhood, whether you stay an afternoon, a week or are lucky enough to live here.